The Sorrento Nightstand in grey is a modern piece of furniture that creates an elegant atmosphere in the bedroom. The Sorrento Bedside Table has 3 useful drawers, ideal for storing your belongings and keeping the bedroom free from clutter. The top of the Sorrento Nightstand is perfect for positioning your bedside lamp, alarm clock and storing your mobile phone. This is a practical night stand in stunning grey fabric, perfect for creating a warm and inviting bedroom. The Sorrento Nightstand frame is covered in the strong and beautiful grey fabric. The addition of the fabric brings extra interest to the piece, while softening the overall look and feel of the nightstand. The grey fabric is complimented by the subtle handle detail, which allow easy access to both drawers. The grey fabric and foam padding used in the Sorrento Nightstand is UK fire retardant. The grey fabric is beautifully contrasted by the dark, low-profile legs of the piece. 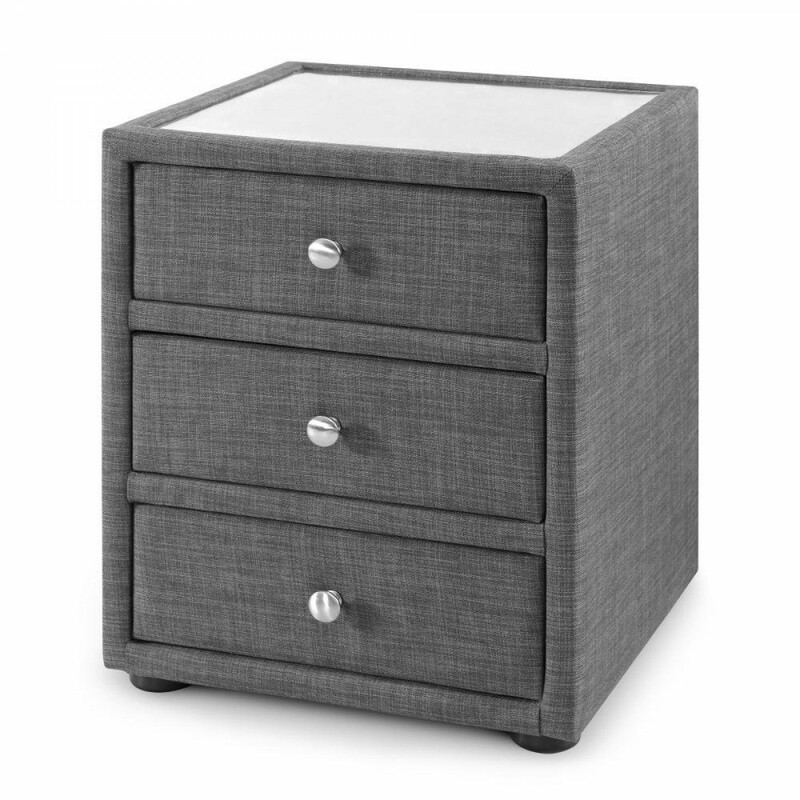 Keep the bedroom free from clutter with the 3 drawers in the Sorrento Nightstand in grey. The drawers provide plenty of space for your favourite books, night creams, chargers and any other items that can quickly leave the bedroom feeling messy. The nightstand is perfectly situated next to the bed or guest bed and can be matched with other pieces from the Sorrento bedroom collection. The Sorrento Nightstand in grey is a stunning piece of furniture that works beautifully in traditional and modern spaces. The Sorrento Bedside Table arrives pre-assembled for your convenience. Use the nightstand in a single, double or master suite to provide a practical storage area next to your bed. The top of the Sorrento Nightstand is large enough to display your bedside essentials, which can also be stored in the drawers! The product is part of the Sorrento Grey Fabric Bedroom Furniture Collection.